The new Sensational Stitched Flowers Card Kit is available NOW! Quick, go grab yourself one HERE before they sell out! I have a couple of bright and cheery cards to share with you today. 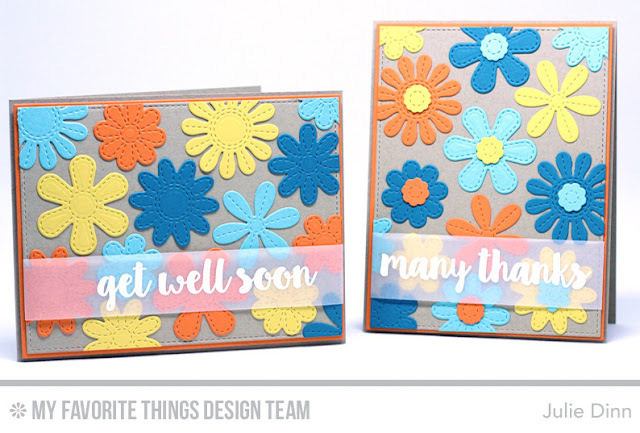 They both feature the Sensational Stitched Flowers Die-namics and All Occasion Sentiments stamp set found in the Sensational Stitched Flowers Card Kit. I die-cut a few sets of flowers in Daffodil, Orange Zest, Cornflower, and Blu Raspberry card stock. These colors are all included in the new card kit. The flowers were arranged in a random pattern on the Kraft card stock. The sentiments were stamped in Versamark Ink on Translucent Vellum and then embossed with Detail White Embossing Powder. The vellum strip was wrapped around the card front. I love the cards you have created with this kit, they are gorgeous! Cheery card that can be changed up for any occasion. I'm sure the cute get well would cheer up someone who's not feeling well. Love the "stitching" on the flowers. 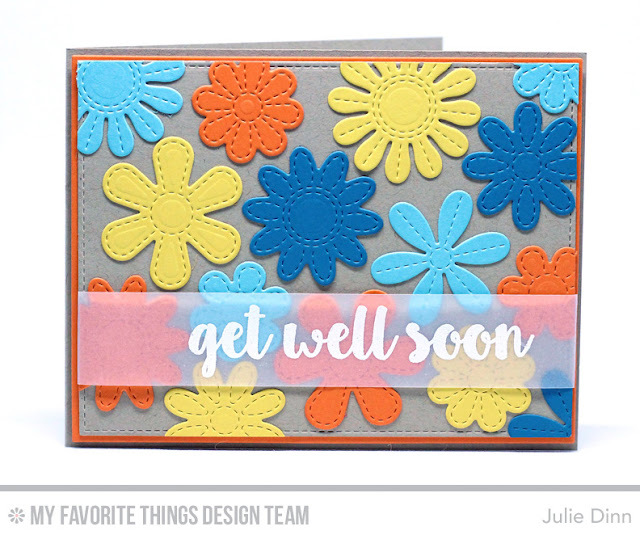 Love the colors used and the vellum sentiment. Wow! How fun, cheerful and down right pretty! Very beautiful background. And love the sentiments in this kit! Wow! Beautiful kit and cards! I love the colours you used!! What fun cards! Love all-over patterns! Thanks for two ideas! Your color combination is gorgeous. Happy cards! Julie, I love the retro 70'2 feel of this card and the colors. gorgeous! such a cute card in those pretty colors! Love these cards, such great color choices! Love your cards and the pretty colors. What a fun card. The colors are so bright and cheerful. Very fun and colorful card designs. So colorful and pretty!! I love the flowers used as a background here!! :) TFS! Love the pretty, cheerful colors! So pretty. 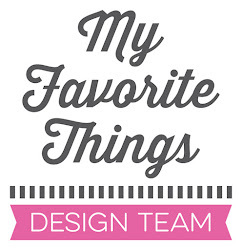 I adore the bold, bright and happy colors of your fun design. Great cards! Love these stitched flowers so much. Such fun cards. They will surely put a smile on the recipient's face. Fabulous cards! Great color combo! Such a fun background with the bright colored flowers! Awesome card! Gorgeous card! Love the bright colours! How cool...it has a neat retro feel! Love this kit!